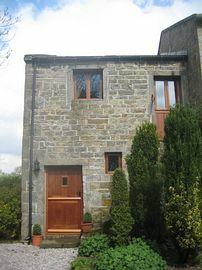 This charming stone cottage forms part of a barn conversion, and is less than 5 minutes walk from Fewston and Swinsty reservoirs in the Washburn Valley north of Otley. 10 miles from Skipton and 9 miles from Harrogate, the cottage is within easy access of the Yorkshire Dales and the Conference Centre of Harrogate. It is ideal for walkers,fishermen,families and mountain bikers. Extra guests can be accommodated as we have a sofa bed in the lounge. Our brand new kitchen completed in March 2012 has a bright dining area with french windows leading onto the patio and garden with table and chairs. 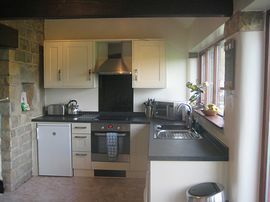 The fully equipped kitchen with washing machine,microwave,kettle,toaster and iron. There is a twin bedroom with shaver socket,hairdryer and ipod dock and a luxurious large walk in shower with wc. The cottage is fully equipped, with central heating. It has a private garden with private parking for 2 cars. Children are welcome; the cottage is non-smoking and we do not accept pets. The garden has furniture for al fresco dining, with splendid views. A pub serving home cooked food is within walking distance approximately 1 mile - a torch is recommended! Leaving Harrogate take the A59 towards Skipton. Follow the road for approx 6/7 miles. You pass the Black Bull pub on your right. Please take the next turn left signed Otley/Fewston. Follow road for 1 mile and take the right hand turn signed Fewston. Follow until you see crossroads - straight accross. As you go down the hill you see a slip road off to your right. Hilltop Barn cottage is located 100 yards on your right. 2 week duration or more please contact for discounts.